Hey everyone. Just like I've been saying all week, I'm playing catch up and trying to get back on track with everything. 2018 has definitely been a rough start for me and it boggles my mind that we're almost halfway through January already!! You can check out their new release HERE <------click! I was invited to guest design on the CLASSroom blog to celebrate the release - and am sharing the cards and video here too! I used the new S'Whale stamp set and coordinating die set to make my cards, along with a new-to-me set of watercolors. The Dr Ph. Martin's Hydrus watercolors have been on the market for however many years, and I got a set of them some time ago, and finally cracked them open to play with and make these cards. I used hot press watercolor paper for my background and for the stamped and heat embossed images. The backgrounds were basically just me dropping in color and pushing it around (easier to show in the video!). I popped up the whales and the sentiments with foam tape, and added some Pretty Pink Posh Sparkling Clear sequins. I finished off the insides of the cards by stamping the cluster of fish images repeatedly, added more sentiments and that was it! I used Ellen Hutson's Leading Ladies - Photo Lady stamp set and coordinating die set for this card. I also found an older polaroid die set that just went perfectly with these images. I ended up fussy cutting out the phone she's holding, and used a craft knife (I LOVE the PenBlades - they're SUPER sharp and the fact that they retract so easily is a good thing for me. I tend to be a klutz and cutting myself happens way too often so these make that way less likely to happen (so far so good and I've been using them for around a year or so now)) to cut around her hand. In the end it looks like the image was stamped like this with her holding the phone! I sponged several Distress Oxide inks onto my background and splattered them with water. I did the same thing with the centre of the Polaroid die cut just to make it all "go" together a little better. I finished off the inside of the card with another sentiment from the set and a couple of the remaining camera images and that was it! Hello everyone! It's a late start to my series of videos and giveaways and videos that I've been promising y'all. The kids and I had a good Christmas, and just spent time together here at home. It is INSANELY cold here right now (this morning we hit around -47C with the windchill - AKA it's COLD). To top it off the reason I'm behind with everything (and possibly why my voice sounds off in the video) is I have the WORST tooth pain - I broke one of my teeth and need a root canal. Of course my dentist (and all the ones we tried calling today including emergency) is off for the holidays. So I'm just struggling to get through the day let alone trying to work and create and edit. I don't wish this sort of pain on anyone (and it doesn't help that I have massive dental anxiety from extremely painful procedures when I was younger). First off is Ellen Hutson LLC - she's provided a coupon code for my followers. You can shop the Ellen Hutson store HERE <-----click! and use the code congratsAmy and save 10% off your order! Valid on in-stock merchandise only. Not valid on previous purchases and cannot be combined with other offers. Coupon code EXCLUDES new Mama Elephant products (released in the last 90 days) and BCRF Fundraiser. Stay tuned to the end of the post for the giveaway! I used the Essential by Ellen Mondo Magnolia stamp set, and after heat embossing the image multiple times onto Canson XL watercolor paper I watercolored it with a couple of Daniel Smith watercolors. I used the coordinating die set to cut out the flower and the inner flower and centre, then stacked them together with foam dimensionals. I used one of the sentiments from the Mondo Magnolia set and heat embossed it with the same copper embossing powder that I had used on the outside and that was it! Ellen has generously donated a $25 gift certificate to the Ellen Hutson store! All you need to do to be entered is follow the steps in the Rafflecopter widget below (make sure you're using an e-mail address that you check frequently as it's how I contact the winner). Thank you so much Ellen for the gift certificate and the coupon code for my followers! Good luck everyone! This month's United We Flourish collab (you can check out all the previous ones here on my Sales & Coupons page!) is with Concord & 9th and it's such a fun set! The set is called Sweet Sprinkles and it's a combo stamp set with the coordinating dies. I pulled out my Distress Oxide inks and went on a rainbow theme with this card. The sprinkles stamp in this set made for a quick and easy background. I staggered the image and stamped it with different colors of Distress Oxides - SO fun. I decided to use the ice cream cone for this card and for both the cones and the "ice cream" I inked up the images with one color of Distress Oxide ink then before stamping I rocked the stamp onto another color of Distress Oxide ink. That way I got the 2 toned images for all the pieces with one stamp impression. I finished off the inside of the card with a stamped sentiment from the set, and stamped the little sprinkles image "on top" of it with the same rainbow of Distress Oxide inks and that was it! Hello everyone! I'm the hostess this week for the Color Throwdown Challenge! You can find all the info along with the CTD Design Team inspiration HERE <-----click! and I'd love for you to play along! I pulled out MFT's Framework Background stamp and the Essentials by Ellen Season to Sparkle stamp set and coordinating die set to create my card. I heat embossed nearly everything with Hero Arts Brass embossing powder. I just love how it looks on the black, grey and white card stocks! The snowflakes were stamped with Delicata Silvery Shimmer ink - it has a subtle shimmer to it - and nearly impossible to see on camera. I think it's pretty and it definitely adds just a touch more than a standard grey dye ink. I finished off the inside of the card with a heat embossed sentiment from the Season to Sparkle set, stamped the snowflakes with the Silvery Shimmer ink and that was it! I stamped my Cozy Lady onto Neenah Solar White 80lb card stock with Hero Arts Intense Black ink and coloured her in with Copic markers. After colouring I used a white gel pen to add a few highlights and whatnot. This week's Color Throwdown Challenge inspired my colors for this card - even though it's cold and snowy here in Saskatchewan I like to think that autumn colors like this are still out and about for some of you wherever you are. After I'd coloured in my Lady Lady and the to-go cup, I used the coordinating dies to cut them both out. I absolutely love that the coordinating die for Cozy Lady cuts around her arm so that you can tuck in the coordinating images from the set. I of course used the to-go cup. Using the cup inspired me to make a quick little matching To-go Cup gift card holder. I used the Honey Bee Stamps Coffee Gift Card Holder dies and happened to have a Starbucks gift card in colors that went PERFECTLY with this card. I used the EH Treat Yo Self wafer die (another favourite of mine - I just got it recently but it's been on my list for the longest time. I was so excited to finally get my hands on it) for both the card and to adhere to the "wrap" on the little gift card holder. I used a glue dot to hold the gift card in place. I finished off the inside of the card by stamping the Cozy Lady on the inside with Distress Oxide ink, then masked her hand and stamped the to-go cup with a different color of ink. I then stamped a sentiment from the Cozy Lady set and that was it! Next stop on the hop is Carly Tee's fabulous blog! <------click! I'm guest designing over on the CLASSroom blog today for Ellen Hutson. I've stepped into Julie's shoes and am the Hello Monday video contributor today! You can check out the post and video HERE <--------click! using the new Leading Lady - Photo Lady stamp set. BUT before you go - leave a comment on this post!! If you leave a comment before November 26th you'll be entered in for a chance to win a $50 coupon to use in the Ellen Hutson store! Hello everyone! Ellen Hutson's November Release went live on November 5th, and all week they've been having mini hops to celebrate - today being one of them! I'm the last stop on the hop today - if you didn't get here from Laurel's blog <-----click! you can start back at the beginning at the CLASSroom blog <-------click! I pulled out one of my favourite color combos of Distress Oxide Inks: Peacock Feathers, Peeled Paint and Salty Ocean to stamp several of the paint stroke images with. After all the stamping with the Distress Oxide inks, I heat embossed one of the Abstract Paint Stroke images with Avery Elle Rich Gold Metallic embossing powder. I also heat embossed one of the sentiments from the new Totally Random Sayings stamp set onto a strip of vellum and adhered it to the card front. My card bases were Neenah Desert Storm 100lb card stock, and I stamped some of the same Abstract Paint Stroke images with the Oxide inks, then added stamped and heat embossed sentiments and that was it! Hello everyone! 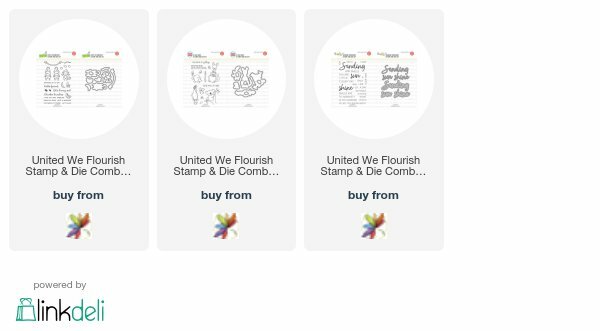 I'm so excited to be participating in a collaborative blog hop between the Honey Bee Stamps and Ellen Hutson llc teams this morning to celebrate their United We Flourish release! There's a TON of inspiration along the way as well as giveaway info so be sure to read to the end! I started pulling out different shades of yellow card stock and then got die cutting and ended up making 2 cards because I was having so much fun! I combined the Sending Sunshine stamps with the coordinating Ray of Sunshine word dies, and the Partly Cloudy (love those little stitched swirls in all the clouds!) and Sunburst A2 Cover Plate dies to create my first scene. For my second card I stamped the words from the Sending Sunshine set onto die cuts I created with the HB Cloud Borders dies, and adhered those over another Sunburst A2 Die cut sun. On the insides of both cards I created sentiments using stamps from the Sending Sunshine stamp set. I have to admit the one on the right just makes me snicker - I like tongue-in-cheek sentiments like that. Next stop on the hop is Carissa Wiley's fab blog <-----click! Now for the GIVEAWAY info - to celebrate, two randomly selected commenters will win a $30 gift certificate to the Ellen Hutson shop. To enter just leave a comment on the Ellen Hutson Classroom blog or the Honey Bee blog by 11:59pm PST on Friday, September 8th. 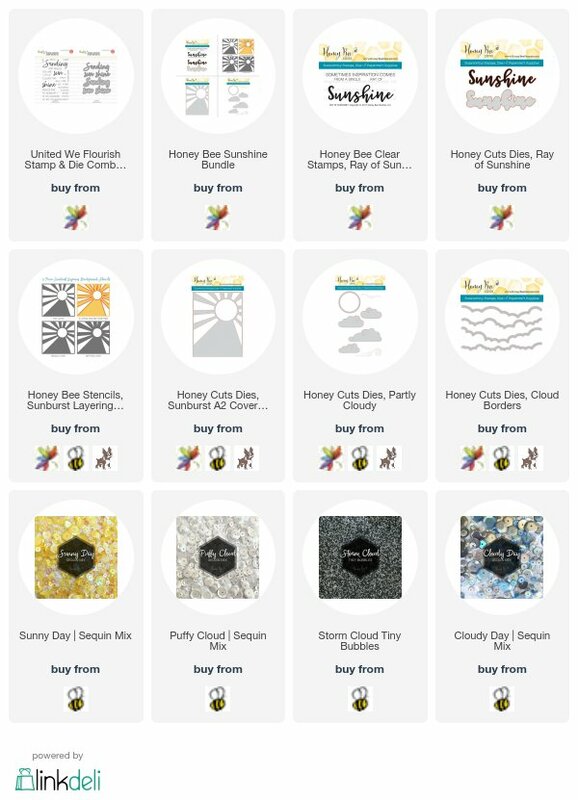 ETA: I wanted to add this note from Melissa (owner of Honey Bee Stamps): Honey Bee Stamps is Sending Sunshine to Texas. For the State of Texas and helping with the recovery, we are donating a portion of the sales to the JJ Watt Hurricane Harvey Relief Fund. This fund gives 100% of all donations back to those in need. I am so proud to be working with such wonderful and generous people/companies (SOOOOO many of my crafting friends in Texas are rallying together and collecting donations and helping those in need - it's been wonderful to see!!). Happy Sunday! I'm SO excited to give y'all a heads up that the latest Ellen Hutson Essentials by Ellen collab for their Untied We Flourish campaign is with Honey Bee Stamps!! I'll have cards and video to share with y'all later this week using this exclusive set but wanted to get on here and let y'all know about it as well as show all the products that coordinate with this new set. So many of the stamps and dies and new sequins Honey Bee has released lately coordinate PERFECTLY with this new EH set! There will be a fun blog hop Sept 1st to celebrate this release plus give a ton of inspiration - I can't wait to see what all the other designers created! I showed the previous collab sets in a haul video HERE <------click! If you missed that post you can check it out HERE <--------click! Happy Friday!!! I hope y'all have fun plans for the weekend! Like I mention in the video - the idea for this card came when I was in bed (letting my mind wander generally means I'm running through to-do lists and grocery lists and cleaning lists.....typical mom stuff - but there's also card ideas being thought up too LOL) and I HAD to get it made while the idea was fresh. I heat embossed the tails multiple times with white embossing powder onto Bristol Smooth card stock, then sponged on the Distress Oxide Inks. I popped up all the tails onto the card front with foam dimensionals, added a sentiment stamped in black and some Pretty Pink Posh Sparkling Clear Confetti sequins. I finished off the inside of the card by stamping all the tails in the same Distress Oxide colors then adding another sentiment from the Mermaid's Tail set and that was it! I decided to create 2 completely different "scenes" for these cards - one using several different Lawn Cuts die sets and the other using Distress Oxides to create a watercolored/splattered background. I started off by stamping most of the images in the set onto Neenah 80lb Solar White card stock with Hero Arts Intense Black ink then colouring them in with Copic markers. For my first card I created my scene by die cutting several different colors of card stock using the Lawn Fawn Leafy Tree Backdrop: Portrait set (and the leaf die from the Landscape set) along with the sun and clouds from the Spring Showers set. For my second card I created a watercolored background using Twisted Citron and Lucky Clover Distress Oxide Inks. I added a die cut sentiment from the Lawn Fawn Scripty Hello Lawn Cuts and attached the vine and monkeys to look like they were swinging off of it. I finished off the insides of both cards with more images and sentiments from the Love Ya Bunches set and that was it!